MOSCOW(Sputnik) - The space crew at the International Space Station (ISS) has not found any new holes caused by an alleged drilling impact at the Soyuz spacecraft docked to the ISS, a source in the rocket and space industry told Sputnik on Friday. "There are no new signs of a drilling impact neither at the ISS, not at Soyuz spacecrafts docked to it," the source said. In late August, Roscosmos state space corporation head Dmitry Rogozin said an air leak and a subsequent drop in pressure occurred at the Soyuz spacecraft docked to the ISS. The ISS crew managed to cope with the problem. Later, Rogozin told reporters that the incident was caused by a hole in the spacecraft's skin, which could have been made through a deliberate drill impact. The spacecraft's manufacturer Energia Rocket and Space Corporation admitted that the hole was deliberately made but failed to name those responsible for that. 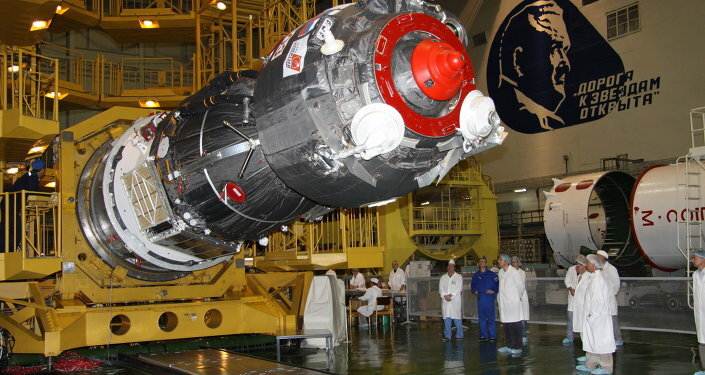 However, a big roup of experts from Roskosmos have put under careful scrutiny the Soyuz MS-10 and Progress MS-11 spacecrafts at the Baikonur Cosmodrome after the air leak incident, a source in the rocket and space industry told Sputnik on Thursday. Russian Deputy Prime Minister Yury Borisov has slammed earlier media reports alleging a version that US astronauts might have been responsible for the emergence of a hole in the fabric of the Soyuz MS-09 spacecraft as "absolutely unacceptable."